The start to the Okolehao Trail hike in Hanalei lies down a narrow picturesque road that leaves you guessing if you’re trespassing along a private driveway or on the road to the trail head. Proceed cautiously forward between taro fields and the grassy bank of the Hanalei river that threatens to swallow your car. Filing past posted warning signs of Children Playing, and Do Not Block Driveway, further convinces you of your mistake. Don’t surrender to these obstacles, continue on as you approach the Hanalei Wildlife Refuge. Native Hawaiian birds go about their routine oblivious to camera toting wildlife lovers. Tending to their clutches or searching for a meal of insects and algae in the ponds of swaying taro. Endangered Hawaiian coastal fowl are attracted to this watery environment that wetland taro thrives in. Hug the side of the road as if you wish you hadn’t declined that collision protection insurance on your rental car and stop to enjoy the show. It’s not uncommon to see Gallinules with their offspring sharing the kalo lo’i or taro ponds with Night Crowned Black Herons, Terns, and Coots just next to this stripe of road that leads to the trail head about one half mile past the historic Hanalei Bridge. Legend tells of illegal stills being operated along the trail during the dark days of Prohibition. Enterprising locals produced an intoxicating moonshine or Okolehao in the Hawaiian language, from Cordyline fruiticosa, commonly known as the Ti plant. The offending stills have long since vanished but the shade covered path remains for you to discover. The trail starts at an easy grade amidst a forest of mangrove trees with their jumbled aerial roots spreading in all directions gaining a foothold in the damp earth. The winding path, directly out of central casting for a Scandinavian film noir quickly straightens, pointing up the side of the Hihimanu Ridge and the cardiovascular workout begins and lame metaphors end. Gnarly Milo and eucalyptus trees with emerald colored lichen remind me of a comfy resting place for theMenehune who were no doubt protecting those distilleries of long ago. Between heavy breaths I notice subtle climatic changes along the trail. From still humid air at sea level to cool trades that are welcome relief at higher elevations. The trail is crisscrossed by step like buttress roots of Eucalyptus robusta, an import from Australia. Offering some aid in climbing the steeper parts of the trail, but soon become obstacles reminding me to lift my tired legs if I want to avoid a muddy fall. When the tree line thins at higher elevation the ubiquitous Strawberry guava, Psidium cattleianum, crowds out most other trees on the trail. If you’re hiking in the late summer you will be rewarded with delicious fruit bursting with flavor and delivering high amounts of vitamin C to a grateful traveler. The last lookout at 1232 feet in elevation you are rewarded with a view that can only be described as ‘fairy tale’ in appearance. Olive colored taro fields create a patchwork that beckons you to find symmetry in the maze of its borders. Tiny Hanalei town rests peacefully protected by this green blanket of soon to be Hawaiian poi and the blue water of the Pacific. A refreshing composition. It’s best to hike the trail when it is dry. Afternoon showers are typical during the heat of the day when water laden clouds collect against the mountains and can make the return slippery. Just when you thought that the hike down was going to be a reward from the steep climb to the lookout. Check local weather conditions before starting out. A walking stick is a handy tool to consider or you will spend time searching for overhanging tree limbs to steady your descent. If insects are attracted to you take along your favorite repellent. Plenty of water and a hat is a must. Practice responsible hiking, keep the trail clean, leave it in better condition than you found it. This 2.3 mile hike can be comfortably completed in 3-4 hours. Hike with a friend it is always better to share the wonders of Kauai with someone special. 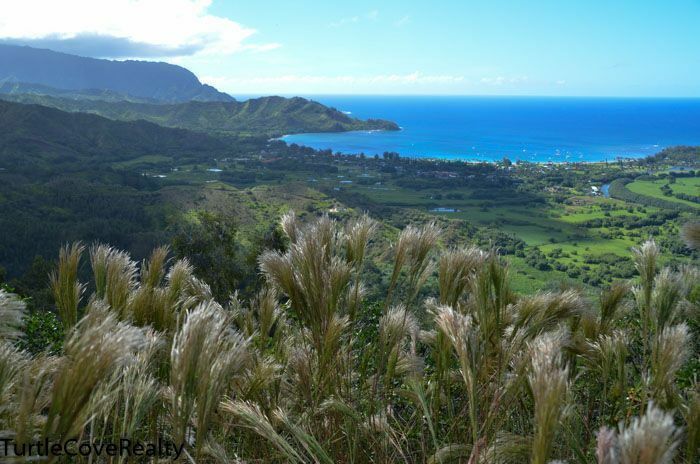 Tell us about your favorite place to hike on Kauai, we’re listening.